There are celebrity endorsed spirits and wine that fall flat on their face – making waves only because of the name or names associated with the brand. Crystal Head Vodka is not one of those “one sided” endorsement only brands, this is actually pretty delicious vodka if I might say so. The vodka is produced in Newfoundland, Canada – and it originally launched in the US back in 2008, now being sold in more than 70 countries around the world. Dan Aykroyd teamed up with artist John Alexander to produce a vessel that mimics the Crystal Skulls that have been discovered across the world, creating many theories of their origin with them. It’s become a symbol of life, reflecting power and enlightenment… perfect for a bottle carrying booze! The original expression is distilling using peaches and cream corn while the newer expression takes a new approach. The new expression of Crystal Head Vodka uses a wheat base to take the flavor profile to a different place. The additive-free vodka is made with English wheat grown in the hills of North Yorkshire, and water from St. John’s Newfoundland. It goes through five distillations, and seven filtrations (the first three using activated charcoal, lasting 6 hours to remove impurities, then three times over 10,000 Herkimer demands before going through a micro filtration before getting bottled. The wheat that is used in the product lends a drier, bolder and spicier flavor that the traditional Crystal Head vodka contains. The delicate floral aromas lead to a subtle hint of anise, and the flavor is warm with strong peppercorn notes and a touch of sweetness. It’s dry and clean with a warming sensation. The bottle itself, in typical crystal skull fashion is a showpiece. 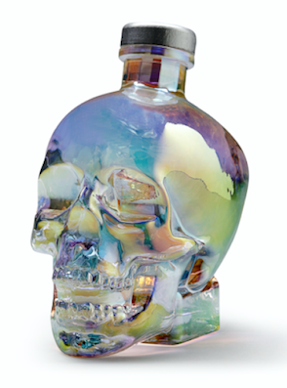 This new handcrafted bottle is an accurate rendering of the human skull. It shines with an iridescent finish, though, unlike it’s sibling bottle. It was designed in celebration of the Northern Lights which the company calls the most vivid aerial phenomenon in the world. To create the effect, each bottle is placed into a sealed chamber and electrically charged. Two metals in powder form are activated seven times and released in the pressurized chamber. The powder is drawn to the electrically charged bottle – completely coating it. Then, at high temperature, the powder melts, creating a uniquely iridescent metallized finish in which no two bottles will ever be alike.